Bob and I successfully removed Bailynn humongous bandage from her back today and with no tears shed! Really, it was from her hairline to her booty crack! Ridiculously huge! She did fabulously! Her back looks amazing. Even with a huge incision down it, it looks awesome. There is no swelling. There are no rods poking out all down her little body. There is no large gooey infection blob at the top. She is trying to straighten her legs out over and over again, she hasn’t done this since the rod placement. She is stretching! She is giggling. She is playing. She is downing tons of food – she took at least 7 of her cups full of different things today. I rarely use the word miracle with our circumstances being what they are. The word miracle, to me, is often too loosely used. 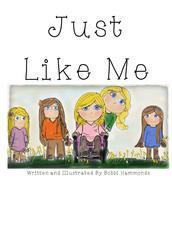 Despite what people would love to believe, Bailynn will never miraculously stand from her wheelchair and walk. She will not open her mouth and talk. She will not dance and play like most people get to enjoy in this life on earth. Does that mean she doesn’t go? No! Does that mean she doesn’t tell? NO!! Does that mean she doesn’t enjoy!? NEVER! She goes, tells, and loves life as much as the next person, just in her own way, and to me that is her miracle. She finds happiness in what she was given and we do as well. We have accepted that her miracle isn’t what would be plaster on the news. Her miracle is her amazing existences. Her lesson in life’s value. Her proof that each day is our prize and we should live it. The amazing recovery from back surgery, her happy demeanor and healthy appetite, I would place in the miracle category. Trust me, this is a hard thing for me to say. If I say she is having a miraculous recovery, I feel like I’m jinxing it, but she is! I made a mother’s necklace today for myself. I have looked at different versions of them online, especially on etsy, and never really had any of them grasp me. I sat down and hand lettered the girls names in my drawing app I use and then laid it on-top of a floral drawing I did. I think it turned out fabulous! See for yourself! The Hammonds necklace I made for myself as well. I didn’t notice the big smudge on the glass when I took it, oh well! It is cleaned off now and looks great too! Are u planning to make them for sale? I would love to have one!